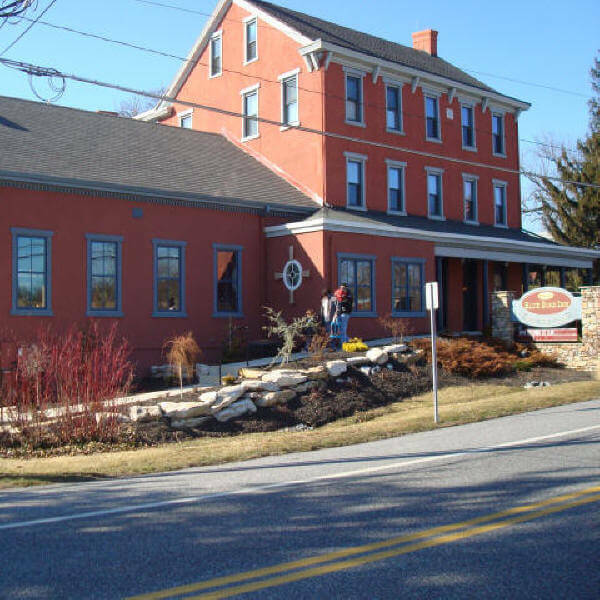 This eatery is one of the oldest continuously operating Inn’s serving food in Pennsylvania. The cornerstone reads “Built by Jos. & Ann Bowman 1859 A.D”. In the early years, the Inn was named Ye Olde Golden Key Hotel. In the early 1900s, it was owned by George S. Trafford. George was born in Jonestown and worked as an Ironworker in his younger years. He was also a master marksman. During Prohibition, The Inn was called Molly’s Tea Room and was just one of the many Tea Rooms, or illegal speak-easies, that operated during Prohibition. Fully renovated in 2009, the historic Blue Bird Inn boasts traditional dining and a classic pub atmosphere that is a local hot spot. The American Cuisine is prepared by an award winning chef. Our menu includes hand carved steaks, fresh seafood & pasta selections, and a complete sandwich and pub fare menu. Our soups are made in-house and are sure to please. The Pub includes fine spirits, martinis, 31 draft beer selections including distinct micro & European Beers, and nine televisions including a 65” flat screen to enjoy your favorite sport and entertainment every Friday from 8:30-11:30 p.m. Our recent addition includes 21 foot high vaulted ceilings, a fireplace second to none, beautiful country views, and an atmosphere sure to please. Seasonal gazebo bar and exquisite outdoor dining.